VOKY is a haven for the modern fashionista, specializing in the versatility of what makes us who we are. We thank you for following along and supporting us! * Small: Bust 35.4"----Length 25.98"
* Medium: Bust 37.4 "----Length 26.77"
* Large: Bust 41.3"----Length 27.55"
* X-Large: Bust 45.3"----Length 28.34"
*All items are individually measured by the "VOKY" Team. 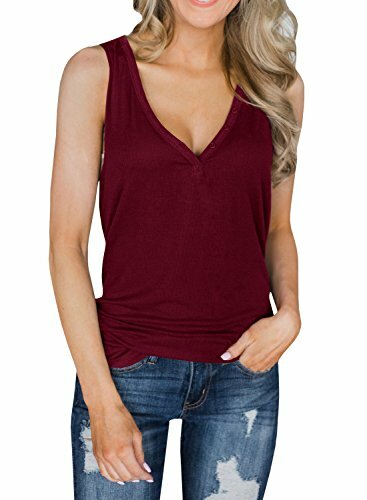 This sleeveless tank has a button up v-neckline that allows you to adjust your neckline coverage. Easy to pair:Sleeveless Vest match well with jeans, leggings, skirts. is good to wear with sweater, jacket, cardigans. Perfect for hot summer as casual or lounge wear,good for club,party, sports, yoga,beach,or daily wear. Sleeveless are PERFECT summer top! You can dress it up with a skirt or wear it casual, business or dressy. It is very versatile, especially for traveling. If you have any questions about this product by VOKY, contact us by completing and submitting the form below. If you are looking for a specif part number, please include it with your message.